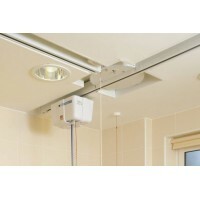 Oxford Ceiling Track is manufactured following High-Safety Standards, the same amount of care is involved when installing the track. The track is made out of high-strength extruded aluminium and coated with bake-paint to ensure a safe and visual profile. There are two types of ceiling track options, straight rail and curved rail. Using the filter system, you can select which size and or angle you require. 2.5m Straight RailOxford Fixed Track 2.5m straight Rail. To find out more about the Oxford Voyager 2..
3m Straight RailOxford Fixed Track 3m straight Rail. To find out more about the Oxford Voyager 3m St..
5m Straight RailOxford Fixed Track 5m straight Rail. To find out more about the Oxford Voyager 5m St..
6m Straight RailOxford Fixed Track 6m straight Rail. To find out more about the Oxford Voyager 6m St..
45 Degree Curved RailOxford Fixed Track 45 degree curved Rail. To find out more about the Oxford Voy..
90 Degree Curved RailOxford Fixed Track 90 degree curved Rail. To find out more about the Oxford Voy..